“According to Robert Baer, a former CIA covert operations specialist, the CIA endorsed the idea of using the Muslim Brotherhood against Nasser in Egypt . In “Sleeping With the Devil,” Baer outlines the tactics of a top-secret U.S. effort: ‘At the bottom of it all was this dirty little secret in Washington : the White House looked on the Muslim Brotherhood as a secret ally, a secret weapon. This covert action started in the 1950’s with the Dulles brothers – Allen at the CIA and John Foster at the State Department when they approved Saudi Arabia’s funding of Egypt’s Muslim Brotherhood against Nasser. The Libya now described in innumerable credible reports, is a failed state, now defenseless against the exploitation or plunder of its resources and people, as a result of United Nations Security Council Resolution 1973 as implemented by US-NATO. Confronted with the horrific consequences of Resolution 1973, adopted by a vote on which they abstained, Russia and China are now desperately trying to prevent a repetition in Syria of this disastrous result, and have three times vetoed attempts by US-NATO members to obtain United Nations Security Council authorization for repeating their crime again in Syria. “Question: Is the United States Government, through any programs or means, trying to destabilize the Assad regime in Syria ? Mr. Toner: Well, the premise of your question is whether we are engaged in. Question: There was no premise. There was no premise. It was a flat-out question. There was no predicate, there was no premise. Mr. Toner: Yes, but, as you know, James, we need to be careful in – to identify what we’re talking about because if you’re talking about a news story based on the contents of – or the alleged contents of classified cables, then I can’t speak to the specific substance of that. Question: I didn’t ask you to speak to anything specific. My question was, very broadly, is the United States Government, through any programs or means, presently working to destabilize the Assad regime in Syria ? If the answer is ‘no’ you should feel free to say so. Mr. Toner: Well we do – and look, this is a – to talk about Syria , but we should also talk globally here. The U.S. democracy and governance programs in Syria , it’s no different than programs that the United States has in many other democratic governments around the world – or countries around the world. This is part of our support for civil society and nongovernmental organizations. What’s different, I think, in this situation is that the Syrian Government perceives this kind of assistance as a threat to its control over the Syrian people. Mr. Toner: No. We are not working to undermine that government. What we are trying to do in Syria , through our civil society support, is to build the kind of democratic institutions, frankly, that we’re trying to do in countries around the globe. My own personal experience, when I was in Poland in the 1980’s, we worked enormously with civil society and nongovernmental organizations. The difference here, as I said is that the Syrian Government perceives this kind of assistance as a threat to its existence. Question: is U.S. Government money continually – or continuing to be funding in any way the Movement for Justice and Development? Question: Can you talk about U.S. support for Barada TV? Mr. Toner: Well, again, I don’t want to go into the details of what was in the – in today’s story in The Washington Post beyond the fact that we are working with a variety of institutions and organizations to support their efforts. Freedom of the press, freedom of expression is an important element of these kinds of programs. And obviously, again, it speaks to the broader content of what we’re trying to do, which is support institutions that promote democracy and democratic ideals. Question: Right, but actually, I don’t think the article did – I mean, the article talked about Barada TV, but it didn’t really have any information about U.S. support for TV. But isn’t it true that the U.S. Government is providing bandwidth capability for the TV station to keep it broadcasting in the face of blocking by the Iranian Government? Mr. Toner: I’ll have to get details of what exactly technical assistance we’re providing them. Question: Is the United States funding opposition groups in Syria ? Ambassador Puri’s reference to armed opposition groups in Syria, already functioning and receiving support as early as May, 2011 raises serious questions about the actual composition of the so-called peaceful demonstrations which began on March 18, 2011, a mere six weeks earlier. The speed with which organized armed groups, already receiving outside support, joined the so-called peaceful demonstrators indicates extraordinary preparation and organization, and the sudden speed with which violence erupted raises further serious questions. Three United Nations draft resolutions followed, condemning the Syrian Government for attacking its own people. All three were vetoed by Russia and China , and later information revealed that many members of the armed opposition were not even Syrians. On October 19, 2012 United Nations Syrian Ambassador Dr. Bashar Ja’afari presented to the Security Council, with a copy to the UN Secretary-General, a letter listing the names and nationalities of 108 foreign individuals who had entered Syria illegally, and were engaged in terrorist activities in Syria . Many on the list of those arrested were members of Al Qaeda. They were nationals of: Iraq , Egypt , Palestinian/Lebanese, Palestinian/Algerian, Lebanese, Jordanian, Tunisian, Libyan, Australian. Ambassador Ja’afari advised me, in a press briefing, that these letters were never acted upon by the Security Council, and the protracted delay in translating them from the Arabic to English was unexplained. The letter contains explicit information about the organizations and specific terrorist acts in which each individual was involved. “Every State has the duty to refrain from organizing, instigating, assisting or participating in terrorist acts in another State, or acquiescing in organized activities within its territory directed toward the commission of such acts. UN Security Council Resolutions 1963 and 1373 are explicit in their condemnation of any and all forms of collusion with terrorism, whether overt or covert, and in characterizing such overt or covert collusion or acquiescence as criminal. Within four weeks, a spectacular and devastating escalation of the conflict in Syria took place: the terrorist attack on July 19, which murdered four of President Assad’s closest aides, and was obviously intended to assassinate President Assad, himself. The terrorist attack was executed with precision, sophistication and skilled professionalism one could scarcely expect from the disorganized, fragmented ragtag militias, described by Western media as so pathetic they were in dire need of massive assistance. Within one week, The New York Times acknowledged extensive al-Qaeda terrorist actions within Syria . Although the June 21 New York Times article had said that CIA officers were in Turkey, “in part to help keep weapons out of the fighters allied with Al Qaeda or other terrorist groups,” they seem to have accomplished exactly the opposite, with a drastic improvement in terrorist operations successfully targeting and slaughtering top Syrian government officials, and the vast increase of Al-Qaeda strength and terrorist activity following close upon the CIA officers’ clandestine visit to Turkey. The scandalous refusal of Western members of the United Nations Security Council to issue a public statement condemning the brazen terrorist attack which murdered the Syrian President’s closest aides and brother-in law, is clearly an attempt to avoid being charged with criminal complicity in acquiescing in this terrorist attempt by the Syrian opposition to murder Syrian President Assad. The October 19letter from the Syrian government addressed to the United Nations Security Council and United Nations Secretary –General Ban Ki-moon, identifying 108 foreign terrorists arrested by the Syrian government for their terrorist activities within the Syrian Arab Republic was ignored. On November 21, the Syrian Ambassador presented another letter to the United Nations Security Council, containing a new list of “143 Foreign and Arab individuals who were killed in Syria while carrying out their terrorist activities.” The list includes information about each individual, name, age, date and place of death, terrorist affiliation, and nationality. They entered the Syrian Arab Republic illegally, and are from: Qatar , Saudi Arabia , Tunisia , Turkey , Yemen , Iraq , Azerbaijan , Chechnya , Kuwait , Palestine , Lebanon , Algeria, Chad and Pakistan . If external support to the Syrian opposition had been prohibited, there would have been no civil war in Syria . By November 28, the Obama Administration, in an effort to finally force the total collapse of the Syrian government, began considering directly arming the Syrian opposition. In view of the fact that Syria , as a nation is now convulsed in a civil war, resulting from the West’s indirect aid to an admittedly terrorist infested opposition, which includes Al Qaeda in Syria now linking its insurgency with Islamic extremists in Iraq , it would not seem necessary to refine assistance to the Syrian opposition any further. But President Assad has survived, and the United States is criminally complicit in providing aid, indirectly or otherwise, to the now largely terrorist opposition. So, by a sleight of hand, on December 12 Obama declared he will recognize the rebels in Syria . The New York Times on December 12 admits that the opposition coalition now recognized by Washington as the legitimate Syrian authority “is still unlikely to be viewed as a legitimate representative by the many Syrians still supporting the government.” Where is the ballyhooed representative democracy in all this? A large part of the Syrian population is hereby disenfranchised. “It is not just Russians who are coming under threat….One senior leader of the opposition movement, Haitham al-Maleh told Al-Jazeera on Wednesday that both Russian and Iranian civilians ‘present legitimate military targets for militants in Syria because their governments have supported Syria’s President. A similar threat came from masked men claiming to be Ms. Kochneva’s captors, who said on Ukranian television, ‘Let not a single Russian, Ukranian or Iranian come out of Syria alive.’” And these are the people the Obama administration just recognized as the legitimate government of Syria . These once proud, independent countries, now demolished, failed states, are rendered vulnerable to control by capitalism’s rapacious oligarchs. Thirty three years ago President Najibullah in Afghanistan had required, by law, that all children, boys and girls, receive secular education; women as well as men held high government ministry positions, and the nation was on track for further economic and social development. But educated people are less malleable or easily manipulated, and so Najibullah had to go. It was in Afghanistan that the Carter administration began funding, training and arming Islamic terrorists. But Texas Republican Charles Wilson, immortalized by Hollywood , was a great fan of the acid hurling, misogynist Hekmatyar. As the war evolved, both Hekmatyar and Saudi Arabia ’s favored client, Abdul Rasul Sayyaff inspired militant terrorist Islamists in Egypt , Algeria , Saudi Arabia , Iraq and elsewhere, including Chechnya and Uzbekistan . This is the global army that the West has been covertly supporting, and it is this force that the United Nations Joint Special Representative for Syria must contend with, along with their sponsors in the West. 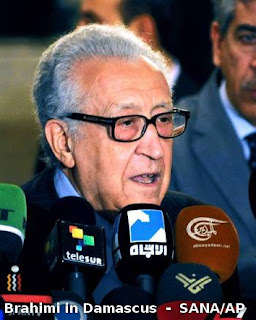 One can only admire Mr. Brahimi for risking his enormous prestige and accepting this mission. And one can only hope for his success in finally ending this psychotic greed for power, before it explodes into a world war. For the next targets will be Russia and China .